South Aussies love their keno, with many punters who wouldn’t normally frequent a land based casino still enjoying the thrill of a quick keno game. If you live in Adelaide or frequent the Festival State, read on to find out what keno games are available, where you can play in the City of Churches, and the best keno sites available online. Keno in South Australia is run by the SA Lotteries commission, a government organisation which appointed the Tatts Group to oversee its keno offerings. With a new game happening every 3.5 minutes you never have to wait long to join in on this game of luck. SA Lotteries has over 590 outlets throughout South Australia. Keno games can be played in newsagencies, petrol stations, pharmacies, pubs, RSL’s and selected TAB venues throughout the state. Keno is a number based game relying purely on luck. There’s no particular strategy or skill required to play, which is what makes it so popular with recreational players hoping to strike it rich. 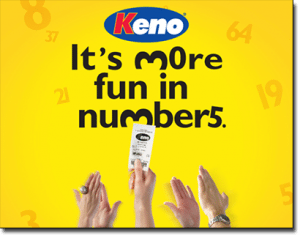 In SA Lotteries keno, players purchase a keno ticket and select up to 10 numbers from a possible pool of 80. You can select as little as one number (called a “spot”) or as many as 10, with the more spots you choose giving you a higher chance to win the million-dollar prize. 20 numbers are then randomly drawn to constitute the winning numbers of the game and the more winning numbers you predicted, the higher your winnings. In order to win the million-dollar jackpot, 10 spots must be selected and you must match all 10 numbers from the 20 numbers drawn. SA Keno games can be played from as little as $1. You can choose to as few as one single draw or as many as 500 consecutive draws. The Coin Toss pays double your bet for any heads or tails win, or four times your bet for any correct guess on evens. You can choose to bet between $1 and $100 per Keno Coin Toss game. What about online keno sites for SA? While SA Lotteries doesn’t run its own online keno site, there are many Aussie-friendly casinos which allow South Australians to play keno online for real money. Playing online keno at online casinos is ideal for those who want to enjoy the thrills of this luck based game and potentially bring in some big bucks, but without all the fuss and hassle of heading to a pub, TAB or newsagency. There’s no standing in line, no putting up with the stench of stale beer and no need to even leave the house. Games at these casinos are powered by RNG (random number generator) technology just like the keno games hosted by SA Lotteries. All you need to do is sign up for an account, make a deposit using a range of safe payment options in AUD, select your keno numbers and watch the results unfold before your eyes. G’day Casino also offers a live dealer keno game, which is a game hosted in real time by a real human and streamed to your computer via high-def video. This is a great option for those who prefer to be able to watch the keno numbers being drawn rather than relying on computerised software. Can I play keno on my mobile? The casinos recommended above also offer the option for mobile play, catering to both Apple iOS and Android operating platforms so games can be played on a wide range of smartphone and tablet makes and models. The mobile casinos only offer a condensed version of the games available at the full desktop sites, and unfortunately keno hasn’t yet been optimised at any of these venues for mobile play, but with the mobile technology expanding rapidly, check back regularly as it won’t be long before keno can be played on the go at these portable sites. Want to give keno a try online? Head to G’day Casino using our links and you’ll receive a 100% matched deposit bonus upon making your first deposit, plus a free slab of beer.